Last year at this time, Xboxers had no fewer than five ways to go deep in virtual ballparks. This year, that number is down to three with Microsoft taking the season off with its Inside Pitch and newly acquired High Heat titles. 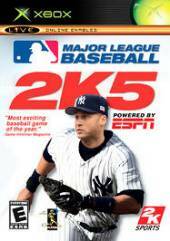 Sega's ESPN Major League Baseball is the last of the three to make it to the plate this season, and while it may fall a few RBIs short of the lofty numbers put up by EA Sports' MVP Baseball, it does more than enough to stay in the pennant race. ESPN's competition played it safe this year by making few major changes to its games. Admittedly, EA had very little to do other than fine-tuning, while Acclaim looks like it hasn't quite figured out what to do next with its All-Star Baseball. In contrast, Sega's game introduces a whole range of innovations this year. The most obvious new concept is the complete ESPN-ization of the thing. From the familiar sounds and faces to the same onscreen graphics used during telecasts, the game perfectly captures the vibe of the cable channel. You almost begin to expect car and beer ads between innings. While the in-game graphics are more detailed than last year, they still can seem stiff. Players may look like they do in real life, but without any emotion -- as if they were all juiced on Botox instead of THG. The game also suffers with occasional bouts of mannequinism, where players will be frozen like statues if they're not involved in the play. On the audio side, Jon Miller and Rex Hudler are usually on the mark, and their stadium-specific commentary is a plus. The reworked batter/pitcher interface may seem dumbed-down at first in comparison to MVP's multi-click pitching system. Here, you pick your spot and fire away. An onscreen effort meter, though, lets you determine the amount of speed or movement on the ball. Use it too much and it'll tire your pitcher out -- use it too little and the opposition will hammer you into the showers. Having to balance between the two adds a bit of strategy, as you can't just go out and try to overpower everyone. On the negative side, spotting your pitch with the left stick can be insanely difficult. You'll have to play a few games on the too-easy rookie level just to get a feel for the incredibly delicate touch you'll need to begin painting the corners. Other than the temperamental pitching, the controls are rock-solid. If the base-running controls in other games forced you to play a very conservative game, the very easy-to-use and intuitive configuration will have you playing a running, stealing National League-style game in no time. Also big is the ability to save games at any point. It's a lifesaver that saves you from having to make those important job-versus-extra-innings decisions. Where ESPN has it all over MVP is in your ability to go online. With an Xbox Live account you'll be able to go head-to-head with other gamers, check how you're doing on the leader boards, and download the latest rosters. While there are plenty of new things to like in ESPN, there are a few new twists that don't work. I thought that DOOM 3 was going to be my next visit to a living, breathing first-person hell until I fired up the first-person mode here. While this view was somewhat cool last fall on the gridiron in ESPN NFL Football, here it becomes a visual and virtual nightmare. Playing it simulates what it must be like to suffer from some serious psychosis. You pitch the ball, the batter hits it, and all of a sudden you're taken to the outfielder's FP view. You shag the ball down and gun it. Your view shifts to that of your cut-off man. He catches it and throws it home, where -- now as the catcher -- you have to catch it lay down the tag. Way too confusing and way too scary. Things don't get much better at the plate, since it's virtually impossible to do anything more than guess at a pitch's location. And when you do swing, you get this slo-mo bullet-time swing that drags gameplay to a halt. Equally underwhelming is the confidence meter. Designed to make the game flow more like its real-life counterpart, it's similar to the momentum meters seen in previous sports games. Here, it's a gauge that keeps track of individual players' emotions. If your third baseman blows a routine play by firing one over the first baseman's head, his confidence will wane and he might not have as much snap on his next throw -- in theory. In reality, it never really seemed to noticeably affect a player's game all that much. Developer Blue Shift made some daring moves with this year's ESPN Major League Baseball, and a lot of them paid off. The single-player game is beefed up with a tweaked pitching interface and the ability to save games at any time. Its biggest coup over its competition from EA Sports, though, is the ability to play online. MVP Baseball might have come out on top this year, but not by much. Tom Clancy's Rainbow Six 3 Black Arrow improves upon the most successful Xbox Live game of all time with new single and multiplayer missions, new online modes, split-screen for cooperative gameplay, a..